Stress – we all get it. Our professional and personal lives are jam-packed with little niggles that build and build until we can’t take any more! Exercise, binge eating or a good action-packed thriller give some of us the natural break we need from the things that stress us the most. Myself, I take to listening to some guitar thrashing music like the Arctic Monkeys’ angry No.1 album Whatever People Say I Am, That’s What I’m Not – followed by a calming walk in the nearby Derbyshire woodlands. 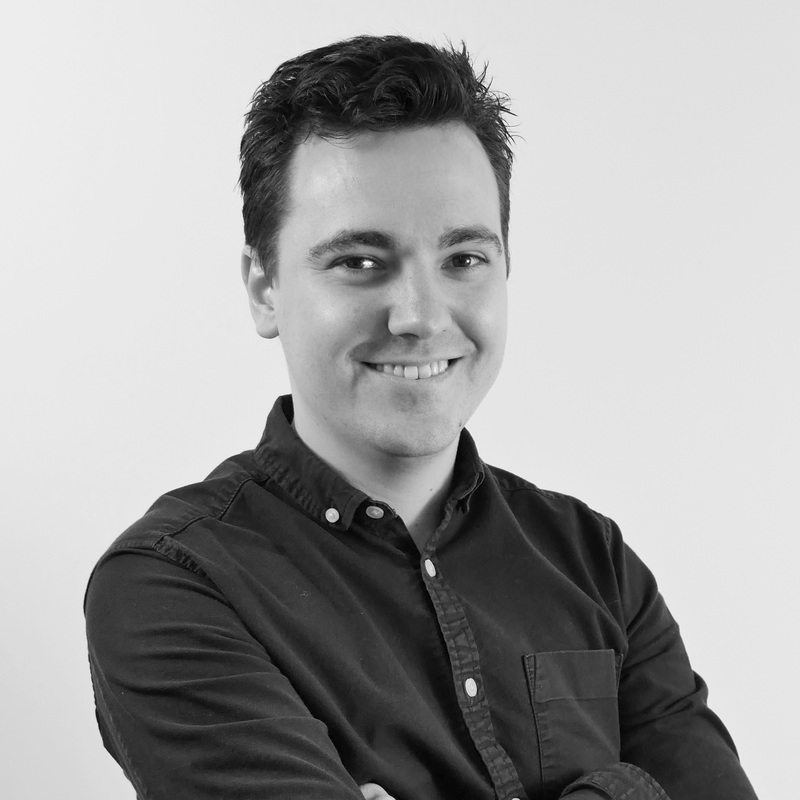 Meditation has never been on my radar as a way to relax – I don’t get those ‘light the candle and sit cross-legged’ vibes but here’s my story of how a little app with a brilliant content marketing strategy attracted, engaged and converted me into a customer in less than 10 days. One of my daily flicks through my Facebook feed delivered the usual cat-falling-off-a-window-ledge video, “AMAZING” goal GIF scored by an Argentine footballer, and, an advert for an app that claimed to relieve stress and release your mind. With a tempting “Free Download” call-to-action and a nice looking graphic (above), I said “I’ll give it a go” and clicked ready to fire up the app when it had finished downloading. After waiting patiently for a whole 30 seconds for the app to download, I decided to fire it up just before going to bed – usually the time when my head spins with thoughts the most. I put my headphones in, clicked on the app and then…serenity. Andy, through a 10 minute audio clip and cool little video, told me how the mind in a calm state should be like a “blue sky” – my thoughts and feelings are merely clouds that stop us from seeing the blue sky sometimes. Words of wisdom were followed by breathing techniques and little tips to keep me going until the next 10 minute session. At the start, not only was I benefitting from the app itself, but I was getting great little emails that helped me along the way just like the one above. This simple gesture both felt great, because I’d achieved something, and also reminded me to continue the habit I’d done for the past 7 nights – 1 week in and I was still enjoying my calming 10 minutes. 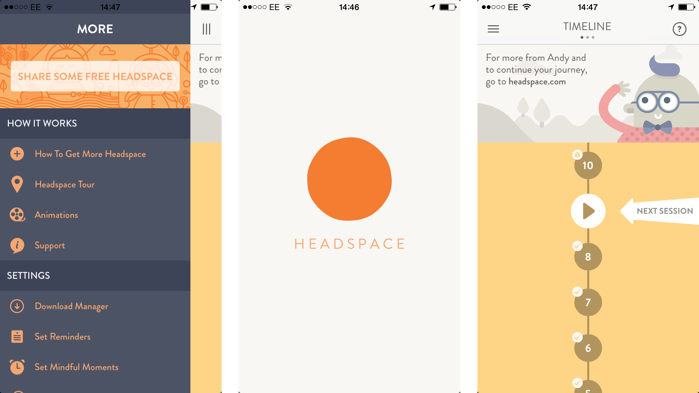 Amongst the nicely designed email was a button that offered more tips and advice on the Headspace Daily blog – a free resource for me to pick tips up to improve other parts of my stressful life along the way. After the success of using the app, I signed up to the blog too! As I came to the end of the trial, I received another email from my new-found friends at Headspace. Can you believe they were offering me 2 FREE months extra if I used the code “SLEEPMORE” if I subscribed to their annual plan? That works out at just £4.16 per month, “less than a fancy sandwich and far fewer crumbs on the carpet” I was reliably told by the email. After the impact the app had on me personally, why would I not sign up? After all, I was sleeping better and not feeling as stressed (especially as the football season had now kicked off!) why would I NOT subscribe to the app? So I did. Good question – I am, and I’m not. Sometimes, even as a digital marketer, you need to take your hats off to a company that has fine-tuned its marketing strategy to increase its subscriber database and ultimately the bottom line. 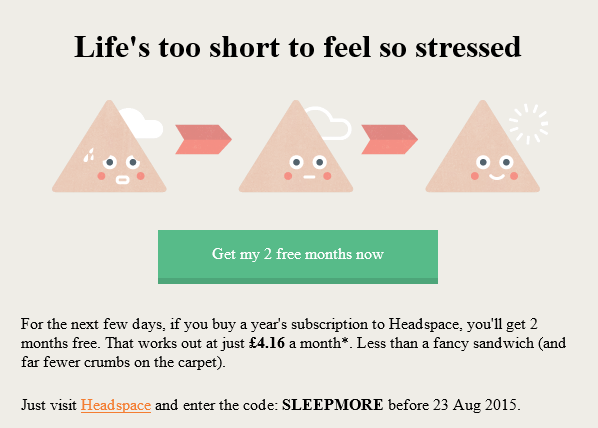 Headspace, through a combination of Facebook adverts, clever emails, free trials and helpful blogs, has created a content marketing strategy that works to convert an un-engaged person to a customer. They’ve thought about their target market (stressed people in their 20s) and planned out a ‘workflow’ to turn me into a customer. Whether I completed the app or not, they would have sent me the offer – but the use of emails and great blogs has compelled me further to say “yes” to purchasing the app on a full time basis. This practice, whether you’re working on behalf of a B2B or B2C company, can be utilised to make your digital assets work better. So many people get stressed about meeting their KPIs or showing a good ROI on a brand new website, for example. Content marketing as an approach is only going to get more popular as time goes on. It’s friendly, it’s personable and it works – any business not thinking of taking this approach soon, do it at their own peril.